My Orange Brompton: Opening a package the painful way! Opening a package the painful way! First of all hello dear readers. It has been a long time since I wrote anything but as you will discover by reading on, I have neither been able nor had the inclination to do so. Way back in the middle of October I got home from a really great club ride to find a brand new Brooks saddle as part of my Titanium Orange Brompton makeover to a fully nocturnal beast. Still in my cycling attire I opened said package with a kitchen knife. Not just any old kitchen knife an incredibly sharp 10 inch variety. Can you guess what happened next? Yes, I became a statistic. I managed to stab the base of my left hand with said knife. There was quite literally blood everywhere, so wrapping my hand in a tea towel and elevating my hand above my heart, I called for Mrs Orange to ring her dad as I needed a trip to the hospital. The first one was a minor injuries unit. After a local anaesthetic, tetanus, X-ray, a course of antibiotics and much prodding around I was sent to the only plastic surgery unit open at this time of night - 18:00. Once there after waiting almost three hours I was given more local anaesthetic and on the receiving end of more prodding around with tweezers and other metal implements. An appointment was made for an operation the following week in order to see if tendons had been cut. The operation, with me still very much awake went okay and after even more prodding around the surgeon informed me that no tendons were cut. The sizeable cut in the muscle bed was stitched up and then the skin stitched. The mother of all bandages were put on my hand and I was free to return home. The stitches were taken out only a few days ago and my hand it still supported by a custom made plastic splint. I have light exercises to do four times a day and will see the surgeon again at the beginning of December. This has of course meant that I am not only off my beloved Brompton bikes but unable to drive. I have done quite a lot of walking lately! It will still be some time until I am on my bike again but I hope to make my return to the fold before Christmas. I really do feel like a total idiot for all of this but I only have myself to blame. It is a good job I have sunny disposition and I have taken great delight in telling every person who has inquired what happened to me, a totally different story! I have attempted to type previously but my hand was either too sore or unwieldy with such a huge bandage on. So, there you have it. Many thanks to all you very kind people who have been emailing me to ask if I was okay or whether I have stopped writing my blog. I am fine and no I have not stopped. 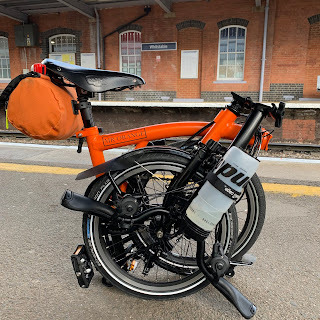 I hope to be back in the swing of things pretty soon and I have loads of blog posts to do with lots of great bicycle items to review - despite the fact I cannot use them at the moment! Good to hear from you Mr O. We've missed your humour, charm, style and expertise. Glad you're on the mend, and look forward to some more of your interesting posts when you're fit again. I was one of the email enquirers. I thought that either you were on hol, had lost interest, or worse....! Sorry to hear this - hope you are on the mend soon - look forward to your adventures in and around London.